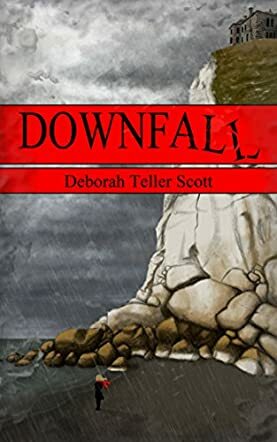 A detective from Scotland Yard must set aside his seaside holiday to find a celebrity missing from a small coastal English village in the mystery tale, Downfall, by Deborah Teller Scott. Detective Michael Dachemont was working on a high-profile murder case until the Chief Superintendent ordered him to leave town. Dubbed Dashing Dachemont by the press because of his exceptional good looks, Michael's presence was creating havoc with the investigation. Leaving London and Scotland Yard behind, Michael is looking forward to a week of relaxation at his family's seaside cottage in southern England. However, before Michael has time to unwind, he is ordered to work with the local constabulary. A guest visiting a nearby home of a prestigious Hollywood personage is assaulted on the property. As Michael begins to investigate the attack, the man disappears. Before Michael can launch his next investigation, the guest shows up unharmed and in good spirits. What is happening here? Is there something sinister behind these occurrences? Downfall by Deborah Teller Scott is a delightful detective novel. The location on the southern coast of England meant my interest was immediately captured by the setting's alluring charm. The story is well written and has interesting characters, an enchanting locale, and an intriguing plot that unfolds in a quiet and peaceful manner. The main character, Michael Dachemont, is an enigma. He holds his thoughts close to himself and doesn't give away any of his hunches. None of the clues is revealed, keeping the reader held in suspense until the very end, when the plot takes a surprising turn and unexpected secrets are disclosed. This is a story that will hold the interest of those who don't wish to be sidetracked by action and excitement. It is a pleasant detective murder mystery that can be enjoyed by all readers.